Jamshedpur FC coach Steve Coppell speaking to reporters in Guwahati. With the NorthEast United FC is set to take on debutants Jamshedpur FC in the second match of the Indian Super League (ISL) season four at the Indira Gandhi Athletic Stadium at Sarusajai here on Saturday, soccer fever has gripped the fans all over Guwahati. The Tata Group-owned Jamshedpur FC will make their debut in the ISL as well as in Indian football while the hosts NorthEast United FC come into the competition as one of the two franchises in ISL who have never reached the play-offs in the last three seasons. “This is our first game and we don’t have collective information about their team. That’s what happens when you are playing your first match,” Jamshedpur FC coach Steve Coppell told reporters in Guwahati on Saturday. 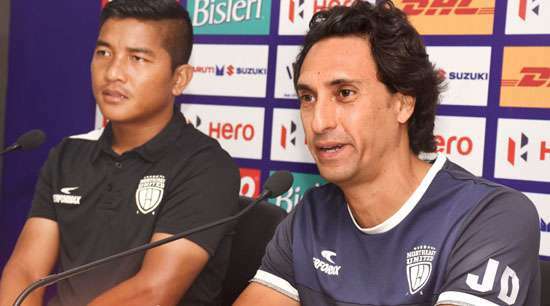 Even though Jamshedpur is new to the ISL, the team has enough experience in its ranks, starting with their coach who guided Kerala Blasters to the final last season. On the field, there will be Jose Luis Espinosa Arroyo in defence, South African Sameehg Doutie in midfield and Senegalese striker Talla N’Diaye. “Coming here (Guwahati) for the first match of the season is difficult. They have got a good team and we don’t know much about them as a team. Once we get few games under our belt, we can prepare better for our oppositions,” said Coppell. NorthEast United have roped in Portuguese Joao Carlos Pires de Deus as their new manager this season and he has several strikers at his disposal, which makes it easy for him to select two forwards.